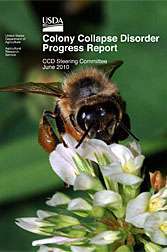 The 2010 Colony Collapse Disorder Progress Report. The U.S. Department of Agriculture has released the 2010 Colony Collapse Disorder (CCD) Progress Report highlighting current research on this still mysterious disease affecting the nation's honey bees. The report, which was mandated by Congress in 2008, summarizes research by federal agencies, state departments of agriculture, universities and private organizations to find the cause of CCD and how to stop or mitigate its impact. The report was produced by USDA's Agricultural Research Service (ARS) and National Institute of Food and Agriculture. "Honey bees are critical to U.S. agriculture, with about 130 crops depending on pollination to add more than $15 billion in crop value annually. It is vital that we find a way to deal with CCD," said ARS Administrator Edward B. Knipling. "This report is an important measure of what we are learning about this serious problem." CCD, a syndrome characterized by the sudden disappearance of all adult honey bees in a colony, was first recognized in 2006. Since then, surveys of beekeepers indicate that the industry is suffering losses of more than 30 percent annually. Before the appearance of CCD, losses averaged 15-20 percent annually from a variety of factors such as varroa mites and other pests and pathogens. During the past three years, numerous causes for CCD have been proposed and investigated. Although the cause or causes of CCD are still unknown, research summarized in the report supports the hypothesis that CCD may be a syndrome caused by many different factors, that work individually or in combination. The sequence and combination may not even be the same in every case, explained Kevin Hackett, ARS national program leader for pollination and co-chair of the USDA CCD Steering Committee. More information: The 2010 CCD Progress Report is available online at: www.ars.usda.gov/is/br/ccd/ccd … ogressreport2010.pdf . Everything else bad, or evil does, after all. That is a very myoptic comment that has absolutely nothing to do with the topic. What concerns me about the CCD is that chemical companies are continuing to manufacture, and the US government is continuing to approve new pesticides that have proven to kill honey bees. Even if in the future CCD is proven to be the result of a virus, the immunological condition of wild and commercial honey bee colonies are compromised by pesticides and other chemicals that are artifically introduced into the eco-system. We MUST, at some point, remember that no matter what science CAN do it doesn't necessarily mean that we should do it. The US was founded by good people during the industrial revolution who have a mechanical mindset. However, Nature is not mechanized, but a intricate weave with an intelligence and ability to grow and balance itself. We are interlopers with a superiority complex who is trying to conquer nature, of which we are a part, rather than working within its laws.